Searching around for an affordable, customer-centric used VW T2 camper van outlet can become a headache; unfortunately, for most motor home enthusiasts, a passionate and professional VW T2 campers garage is impossible to find. Within a relatively short time of operating within the South of England, VW Kampers have quickly become the most popular retailer of used VW T2 camper van motor homes for sale to enthusiasts throughout Brighton and the wider area of Southern England, UK. This isn’t merely a lucky strike, but rather the hard-won result of a family run, passionate business that recognised the lack of services available for Danbury Campers and T2 camper van owners, sellers or potential-buyers. Make no mistake: we don’t just deal with these cars, we love them. When you come to us, you’ll quickly realise that you’re not dealing with just another run of the mill, second hand car dealership or garage. We once stood where you stood; as regular VW T2 campervans, as their lovers, simply looking for a decent garage to do some repairs. Rest assured; we know how it feels and we know the struggle of finding someone professional and knowledgeable enough to handle such beautiful and charismatic vehicles. This is why you can trust us to not only sell you the finest in used VW T2 camper van stock, but also offer all current VW T2 camper van motor home owners a huge range of motor services – all from our dedicated, likeminded staff. Working with the VW T2 campervan isn’t just a case of buying in and selling off. This is due to so many adoring owners relying on us to deliver a top quality service long after the sale. 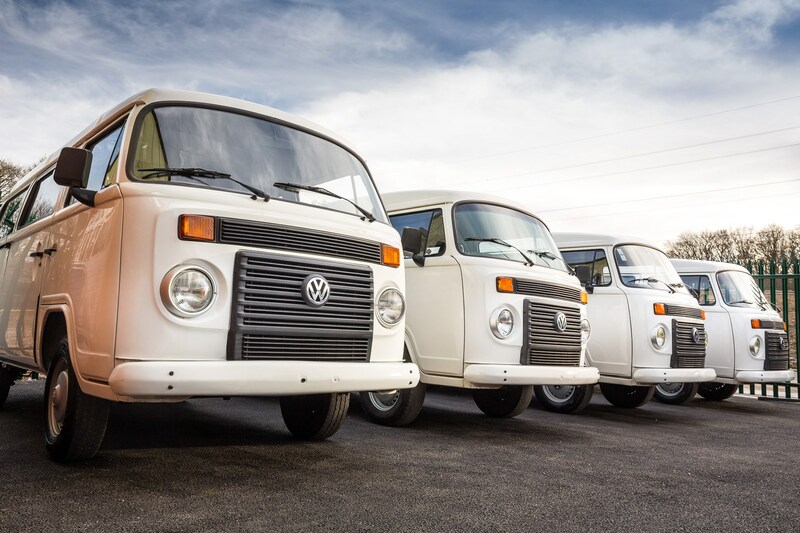 VW camper vans finance is available on our pages to help make your dreams of modification an actual reality. A complete, professional and thorough vehicle service with all industry-standard examinations. Full-body resprays or touch-ups of custom colour ways bring a stale or faded VW T2 motor home back to its once vibrant life. A wide range of interior work, like complete bespoke upholstery, interior colour ways, 4 berth conversions on all motor homes to make your camper a little more personal. Power steering installation to put a little bit of modern technology in the older VW T2 camper vans. Conversions for that iconic ‘pop top roof’ style. A huge, extensive range of other services from the smallest style tweaks to huge mechanical overhauls – anything VW T2 camper van motor home orientated, we have you covered. Don’t just take our word for it! Of course, it’s all well and good for us to tell you about how much we love the VW T2 camper van, but you want some assurance that your beloved car is being put in capable hands. Take some inspiration from our list of happy customers, over on our testimonial page. You’ll quickly see why VW Kampers Ltd is the South’s most popular VW T2 camper van motor home retailer. And the best part? There’s nothing stopping you from joining the ranks of those ecstatic customers! Check out our services and quality second hand stock now, for a fantastic deal on everything ‘VW T2 camper van’. Or, are you looking to sell your old camper for a fair price? Make sure to check out our ‘Want to Sell’ for new and retro camper vans for sale and fill out the forms to get things rolling! New VW Kampers Service and Maintenance centre is now open! What Happens in a Brazilian T2 Conversion?